Big Bungee Piranha is the castle boss of World 2 in Yoshi's Island DS. It is a giant, purple Bungee Piranha that hangs from the ceiling and lunges down to bite Blue Yoshi. 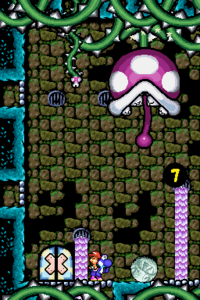 To beat it, Yoshi must eat Nipper Plants and make eggs and then stand on top of the Chomp Rock present in the boss fight. When Big Bungee Piranha reaches down to devour him, Yoshi must move out of the way quickly, and Big Bungee Piranha will bite on the Chomp Rock and howl in pain for a few seconds, revealing its weak spot: its tongue. Yoshi has to shoot an egg at the tongue before the boss revokes it. After having thrown three eggs at Big Bungee Piranha's tongue, the massive creature will be defeated and fall at Yoshi's feet. After two hits, Big Bungee Piranha will become progressively faster. Big Bungee Piranha somewhat resembles and may have replaced Naval Piranha from Super Mario World 2: Yoshi's Island. The Big Bungee Piranha has several Bungee Buds. In Super Smash Bros. Ultimate, Big Bungee Piranha is mentioned briefly by Viridi during Palutena's Guidance dialogue for Piranha Plant. Viridi mentions it in plural form, implying that Big Bungee Piranhas are a species. Spanish (NOE) Grande Puentiraña Grand Bridgeranha (Puentiraña comes possibly from Puente - Bridge and Piraña). This page was last edited on April 11, 2019, at 18:09.